Blend everything to a sandy consistency, then press into a spring form pan. Bake for 20-25 min at 375F. Cut a sugar pie or other sweet pumpkin varietal in half. Scoop out seeds and gunk. Save the seeds to roast with salt and spices. Roast for 40 minutes at 375F. Place 1 cup of the pumpkin flesh into blender and blend together with the buttermilk and sugar. Allow to cool slightly. Beat the cream cheese, buttermilk, flour and sugar together, then add the eggs individually, being sure that each one is fully incorporated before adding the next. Add vanilla and spices. Once the crust has had a chance to cool to room temperature, pour in the cream cheese filling and dot with puréed pumpkin, taking a knife and swirling it about (in the pan that is, not the air). Lower the temperature to 350F and prepare a water bath for your cheesecake to bake in. Place heavy duty aluminum foil around the spring form pan. I don’t have heavy duty aluminum foil, so I used a few layers of regular foil to feel more secure. Bake for 1 1/2 hours, or until the center doesn’t wobble when you jiggle the pan. 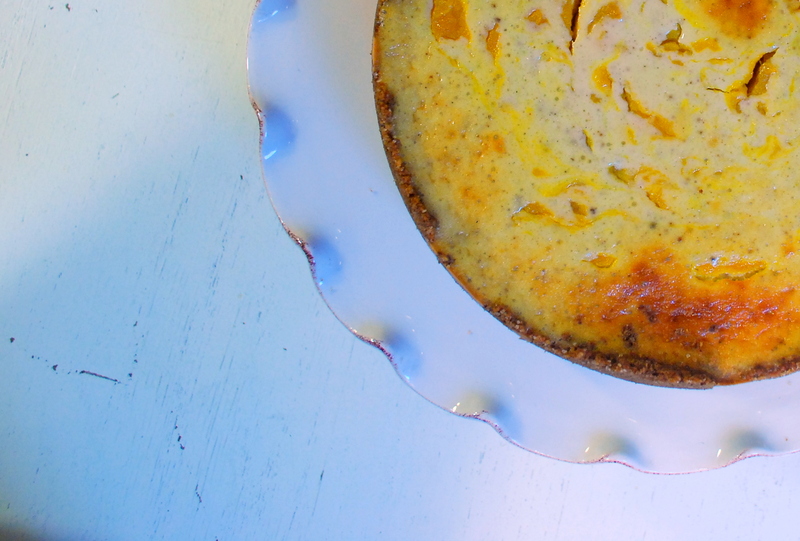 My cheesecake ended up with a bit of a brûlée on top, and I just happen to like that. If the idea of a slightly caramelized top makes you sad, bake at a slightly lower temperature for a longer period of time. When you take your beautiful cheesecake out of the oven, leave it to cool in the water bath. If you remove it from the water bath, the top may crack, and after all your hard work, that could be a tad devastating. 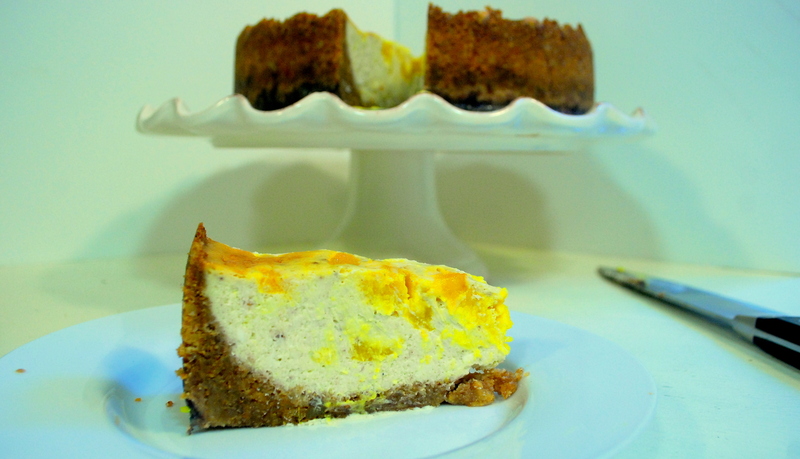 Once the cheesecake has cooled completely, place in the refrigerator for at least a few hours, preferably overnight.